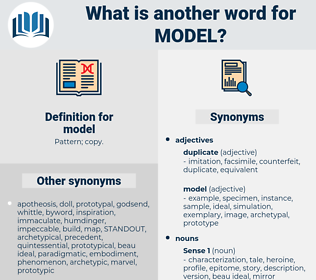 What is another word for model? person to look up to. modalities, Recommendations, directions, markets, Copies, modelo, Histories, LINEs. structures, blueprints, lessons, Guidelines, approaches, linkages, experts, ratings, auspices, sorts, guys, LINEs. data, blueprint, modality, Formulae, manikin. designed, Emulated, developed, Replicated, applied, used, Regarded, paid, based. exemplar, paragon, mode, specimen, inspiration. different, irregular, atypical, imperfect, unusual, abnormal, uncharacteristic. representative, average, failed, unworthy, ordinary, unsatisfactory, substandard, low-grade, wretched, bad, deficient, typical, inferior, atrocious, mediocre, execrable, normal, vile, inadequate, disappointing, poor, second-rate. I will make him my model, if you will take his example, directly, directly! I may long to box the ears of the whole class, but it is my duty to keep a smiling face and to be a model of patience. mantell, Mohammed Ali, mentally ill, manhandle, mitella, mattole, mantel, matthiola, mandalay, mandala, meadow lily, mantle, mannitol, mental, methyl, mottle, mayetiola, monumental, monthly, module, mandela, momently, modal, mettle, mantilla, menthol, middle, mouth hole, mandola, medulla, minutely, madly, motel, mutely, mutually, Madia Oil, medley, muddle, metal, Mehemet Ali, motley, mutual, motile, meddle, medal, Muhammad Ali, medial, mendel.